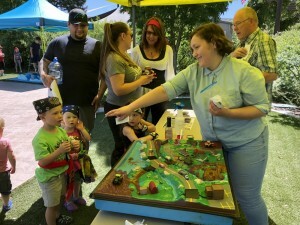 We gave our fellow Utahns plenty of reason to look forward to the Central Utah Water Conservancy District’s next Water Festival in late May, entertaining this year’s crowd with beautiful blooms, fun games, and – Arr! – lots of pirates! But for Trevor Crandall, a graduate student at Brigham Young University, it was a Ben Franklin moment that he’ll remember most. In partnership with the Utah Lake Research Collaborative, he worked a booth at the festival recruiting citizen scientists and letting people know what they could do on a daily basis to make a difference. Spraying a mixture of soy sauce, oregano, and Kool-Aid (representing pollutants oil, grass clippings, and herbicides and pesticides) down a mock storm drain provided a great visual of what shows up in Utah Lake. They’ll get their chance July 14 when the BYU students and the Utah Lake Research Collaborative ask citizen scientists to gather water samples from hundreds of locations in the Utah Lake watershed. “Our volunteers are super important to us,” Crandall said. And once signed up – go to the utahlakecollab.wixsite.com/utahlakecollab website or come early to sign in – the citizen scientists will meet at the BYU Duck Pond between 9 a.m. and 1 p.m. to pick up their sample kits. From noon to 4 p.m., they can return to the pond to drop their samples off. The research team will begin processing the samples almost immediately, he said, measuring the water’s nutrients and turbidity – how murky it is – as it creates a big picture of one moment in time. And if a consistent pattern emerges, such as an abundance of a certain nutrient, it will lead to further studies. Crandall has a unique perspective on stream sampling. He started as a citizen scientist himself, which has brought some adjustments to how they will do things July 14.